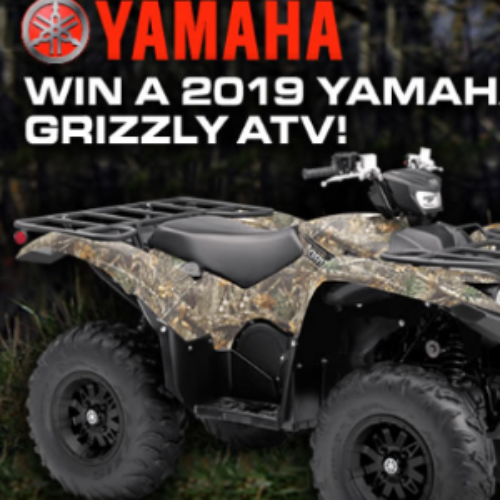 You can enter the Hunt Giveaway from Buckmasters weekly for your chance to win a 2019 Yamaha Grizzly ATV valued at $9,899. The trail-ready Yamaha Grizzly is the best performing ATV in it’s class with superior capability, all-day comfort, and legendary reliability. If you love the great outdoors you don’t want to miss out on this opportunity! Please note the sweepstakes is not valid in FL, NY and RI. Entry ends December 15, 2019. I would love to Win a 2019 Yamaha Grizzly ATV. Oh yes, with 3 grandsons and loads of woods nearby, this would be utterly amazing. This would help . Tired walking in the woods. I want to win the 2019 Yamaha Grizzly.